CKD Galbraith has sold a rarely available industrial investment at 10-11 Royal Park Place, Edinburgh EH8 8HZ to a private individual for 460,000. The investment deal for the small industrial estate was made on behalf of Robert Hunter & Sons and reflects a net initial yield of 10.63%. Comprising seven units each varying in size from 438 sq ft to 1,766 sq ft, the estate extends to 7,291 sq ft. 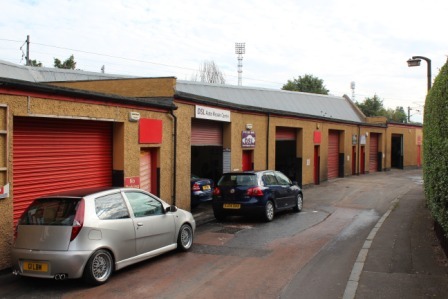 The single storey units, which offer roller shutter access directly to Royal Park Place, are let to six tenants in local vehicle and motor trade, including Edinburgh Pedicabs. Located in central Edinburgh, the estate is close to Meadowbank Sports Centre, Abbeyhill Industrial Estate and the Meadowbank Retail Park. Ian Forbes, Investment Agency Associate at CKD Galbraith, said: "This type of investment rarely comes to market in Edinburgh, particularly as there is a real shortage of small lockup workshop units of this size available within Edinburgh city centre, which has resulted in proven occupier demand over a number of years. At this property in particular, management is relatively simple as tenants are contained within their own units and any vacant units have been let without the appointment of agents in recent years. "As CKD Galbraith is very active in the Edinburgh industrial and workshop market we understood this type of investment and were able to target purchasers who could appreciate the opportunity." Viiew commercial property currently for sale or rent through CKD Galbraith.